NextPool is your single access to solutions from our integrated design offices, which have a common goal: to help you earn the trust of your clients in order to guarantee your long term growth. NextPool is the daily commitment of conscientious and professional men and women committed to your success. 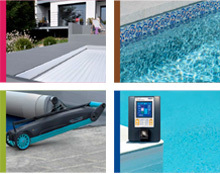 NextPool is a member of the Fédération des Professionnels de la Piscine (French Federation of Swimming Pool Professionals) and on a continuous basis, in the field and within its communication supports, strives towards professionalisation of the sector and enhancement of the profession of swimming pool manufacturer.